While the physician office lab‘s LIS needs are modest in comparison to those of single-purpose labs, one option the POL system should support is the ability to link up to other applications, databases and/or devices, such as instruments used for assays, to streamline the data management involved. It is common for the POL to want to pass patient data from/to an EHR, for instance, so that assay requests are linked correctly with the patient and sent automatically to the lab, or pass the LIS results report to the EHR or a patient portal for viewing. Of course, interfacing to any testing instruments is very common indeed, to eliminate the transcription errors and time involved with manual entry. Other systems or services (e.g. billing) and/or agencies (state reporting, CDC reporting) may also be entities with which the POL may want to integrate. Additionally, any proprietary O/S (operating system – e.g. Windows, Linux, OSX etc.) or other ancillary apps or hardware limitations affect the degree to which the LIS can inter-operate. It should be flexible and compatible with common environments. These User Requirement Specifications relate to the POL LIS’s abilities to meet these kinds of criteria. [Template fetch failed for https://www.limspec.com/index.php/Template:Specification_POL_S0031_Compatibility?action=render: HTTP 500]HealthCloudPOL is the ultimate in compatibility. It is cloud-hosted, so all that is needed to access it and use it is a web browser. It can be accessed from anywhere there is Internet access, any time. That means PC, Mac, tablet, mobile phone – whatever you like. Any authorized users can log into their HealthCloud Physician Office LIS and register/accession specimens, enter/approve results, look up data, reports etc. or do any of the range of functions their free, professional HealthCloudPOL system provides. [Template fetch failed for https://www.limspec.com/index.php/Template:Specification_POL_S0011_Interfacing?action=render: HTTP 500]HealthCloudPOL fits with any physician office lab environment, because it is cloud-based and can be accessed from any Internet-capable device. The second component of HealthCloudPOL’s compatibility is its ability to be interfaced with any other system, device/instrument, database, service or other entity in any ways they connect, if the HealthCloudPOL Standard Edition subscription is selected. Interface plugins are readily available to be included with your LIS or any time you choose. They support any format necessary, including but not limited to REST API services, SOAP API services and File Import Export services for CSV, XML, JSON, XLS, DDE, OLE2, ODBC and more. HealthCloudPOL can interface with anything that has an API. Or it can interface through file sharing. 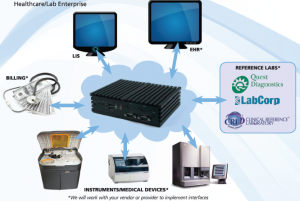 Basically, anything that can be interfaced can be interfaced to the LabLynx, Inc. HealthCloudPOL Physician Office LIS, using our exclusive HealthCloudHub solution. LOINC, SNOMED and PHIN are among the formatted communications systems HealthCloudPOL Standard is capable of integrating with, and the HealthCloudHub Integration Plugin library includes those available channels. ↑ “LIS3-A Standard Guide for Selection of a Clinical Laboratory Information Management System”. CLSI LIS3-A Standard , 6.6.2.4. CLSI (NCCLS). http://clsi.org. Retrieved 30 July 2015. ↑ “Interoperability”. Government information site. HealthIT.gov. http://http://www.healthit.gov/policy-researchers-implementers/interoperability. Retrieved 3 Aug 2015. ↑ “Standard Guide for Laboratory Informatics”. ASTM Standard 1578-13, 7.2.2.2 Core Design Flexibility. ASTM International. http://www.astm.org/Standards/E1578.htm. Retrieved 29 July 2015.